Presented by Mrs C. E. Luard, 1936. These seven objects belonged to a large collection of brass images, ritual objects, implements, ornaments and toys which was formed by Major (later colonel) C. Eckford Luard in the former Central Indian Agency between 1900 and 1903. Luard served in this area for a number of years as Superintendent of Gazetteer and of Census Operations. He compiled the several volumes of Central Indian State Gazetteers (1907-12), as well as writing other works, including guide-books to Dhar and Mandu and the Dilwara temples at Mount Abu. 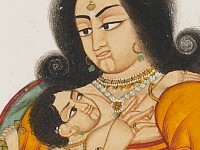 In later life he lived at Boar’s Hill, Oxford, and part of his collection was presented to the Indian Institute’s museum by his widow in 1936 [see EAOS.108]. 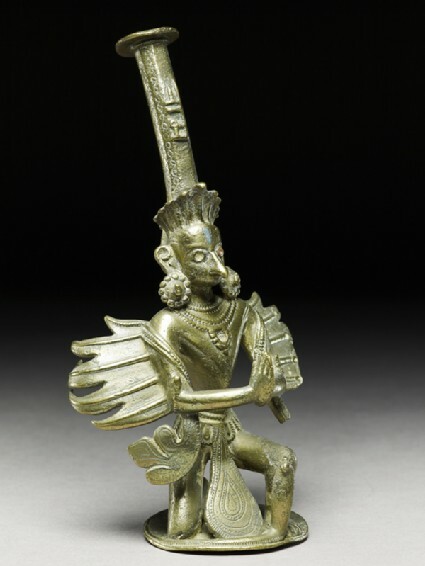 Luard’s earlier article describing the collection in the Journal of Indian Art and Industry is still useful in the identification of regional types of such late brass objects, which are otherwise scantily documented. Another incense holder is in the form of Viṣṇu’s vehicle, the celestial bird Garuḍa [EAX.281], represented as a beak-nosed bird-man kneeling in the gesture of adoration or salutation (añjali-mudrā). Flame-like wings and hanging drapes (damaged at the right side) emanate from his upper arms. A snake (nāga) – traditionally Garuḍa’s enemy and his chief food – rests docilely in front of him. On the tubular agarbatti-holder rising from his crown the name of the god Rām appears in relief.